This is my first post, having been lurking here for a few weeks. This is a fabulous website and it has accelerated my learning and increased my enjoyment of my new hobby a great deal. I started baking bread a few months ago as an antidote to revision for my university finals. My initial attempts were flat and dense bricks and puddles, more like squashed soda breads. But since finding this site a few weeks ago I've been inspired to put a bit more energy in and try out some of the techniques I've been reading about and watching on the various youtube videos dotted around. - Poolish - 250g flour, 2g yeast, @100% hydration. Fridge for 7 hours. - Allow an hour to warm, add the rest of the ingredients. Fridge for 2 hours then in the pantry (which is about 10 degrees C at the moment) for 5 hours. I slit and sprayed with water, then put them (on baking paper) on the floor of the Aga, which has had a small pan of water on a higher shelf boiling away for the duration for constant steam. Took about 35 minutes to cook - a bit longer than the recipe says - the floor of the Aga is at a lower temperature than the recipe calls for but my feeling is that having them directly on a nice, big, heavy, high thermal mass aga oven floor is A Good Thing. I don't have a stone slab but I guess putting that higher in the oven would be the better way to do it. I wasn't expecting much - this was a real step up in shaping complexity (I was guided by the <i>excellent</i> Ciril Hitz videos) and more difficult slashing than my usual cave-man technique. But I was pleasantly surprised by what came out of the oven! I'm really quite excited to try this again. Next time I'll plan ahead more thoroughly and give it the 21 hours fridge fermentation that the original recipe calls for. I'll not bother with the poolish stage either (I did it as I thought it might give me the flavours and gluten development a little quicker). I've been getting quite into using a poolish. I've just come back from a bit of travelling and decided tot to make a sourdough starter until i got back (just so I could be around to care for it) so a poolish seemed like a good stop-gap for getting a bit more flavour out of the flour. For fun, here's a photo of another recent session. - 1kg of flour (2/3 whole grain 1/3 strong white), 500g of which was in a 100% hydration poolish overnight in the fridge. - teaspoon of dark brown sugar. I cut the slashes quite deel on the nearer boule, but the loaf still sprang right up to the point of stretching them out flush with the rest of the crust. Given they have so much spring left to give, should I prove them a bit longer? Anyway, thanks for reading, now I need to go an feed my new starter! 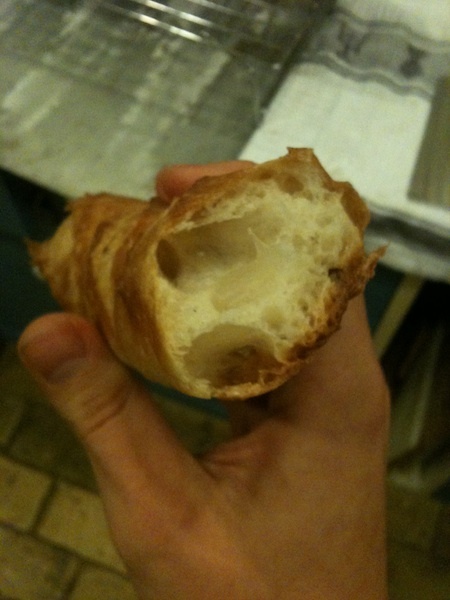 Your loaves are great looking, love the crumb of your baguette, TFLoafers love crumb shots! Very attractive and delicious looking boules. For being fairly new to baking bread you have a lot of talent. Thanks Sylvia! That's an enormous complement coming from you. I've been using your 'super steam' technique for the past few bakes and it works really nicely - thanks for sharing it! Welcome to TFL! Nice to see you "de-lurking" - and with excellent reason, so many nice breads! Those are great looking loaves, Ed. 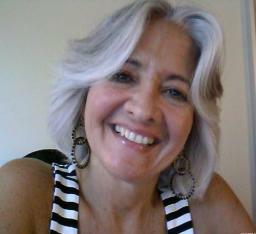 Looking forward to seeing more from you, and welcome to the site. Wow Ed, Talk about making an entrance! 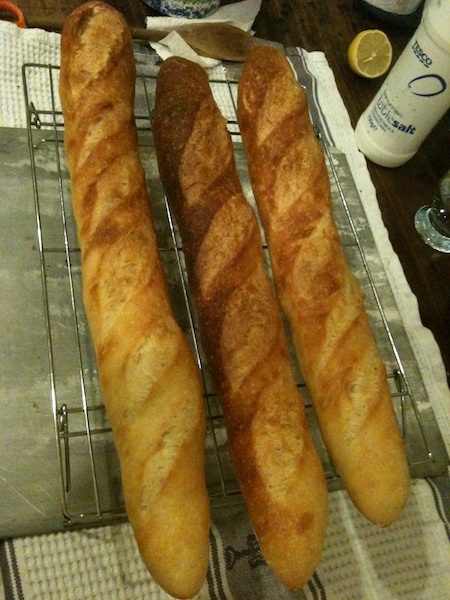 All your loaves look terrific, but the baguettes for a first time bake are quite impressive. Baguette shaping can be one of the more difficult shaping techniques but yours are pretty consistent. The left hand side one might have a bit of a curve to it, but I've seen much worse being sold in bakeries, and I'm sure you have as well. As a matter of fact, if I was shopping for bread I wouldn't hesitate to pay money for any of these loaves. Well done, and welcome to TFL. I can only echo the opinions already expressed: An outstanding bake, beginner or not. Looking forward to see more of your breads. There's nothing beginner-ish about those loaves, and the baguettes are really lovely looking. Welcome to TFL; I look forward to more posts! Welcome. How did you get the flour on you spiral shaped boule? Really looks great! Hi Pam, I floured the top first and then cut a spiral by hand with a razor blade. So the non-floured bits are oven spring. I didn't have a banneton at the time (though that has changed since father christmas brought me an early present!) but wanted to get something a bit like a banneton effect. Engineer, baker, you're obviously a person of many talents! You don't mind if I call you EdTheBaker do you?! 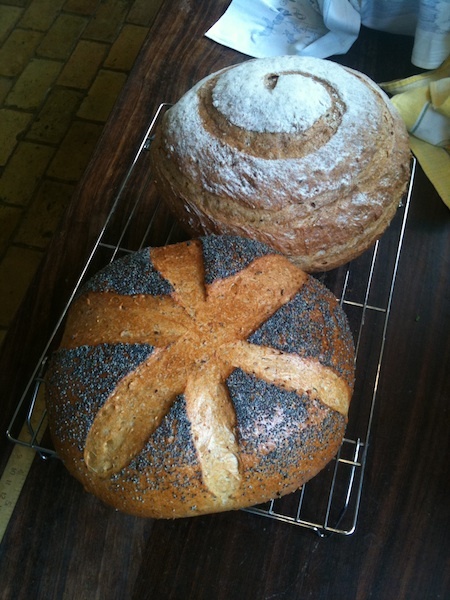 Thanks for sharing your beautiful breads and I just love the idea of your 'swirly-boule'. You are off to a great start! And obviously have a touch for dough! Welcome to TFL! 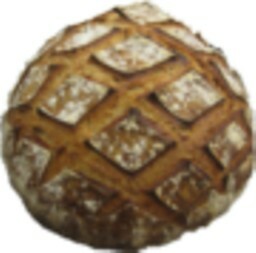 Your breads are top notch and very professional looking! I think you get a go to the head of the class grade level leap. I'm sure if you've been lurking very long you've found some exceptionally talented bakers who are very generous with their support and encouragement. Good job & I would say you should email them to or post your pics at Ciril Hitz's site...breadhitz.com. I'm sure he'd love to see them. Does it still possible to shape like Ciril Hitz's demonstration? My dough was wetter than the one in the video, and very sticky. Or, the dough for baguette shouldn't be so wet?